In New Mexico, A Brotherhood Of Ancient Hymns Life, death and piety are the recurring themes in hauntingly beautiful alabados preserved by lay brothers called penitentes. "You have to feel them," one says. "You have to feel them in your soul." 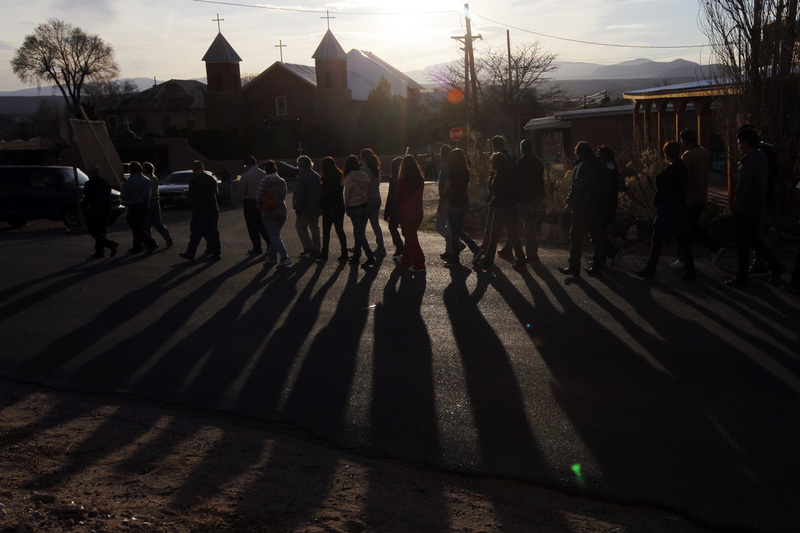 The faithful follow penitentes — lay members of a Catholic brotherhood — to Mass at Holy Cross Catholic Church in Santa Cruz, N.M., on Holy Thursday in 2013. 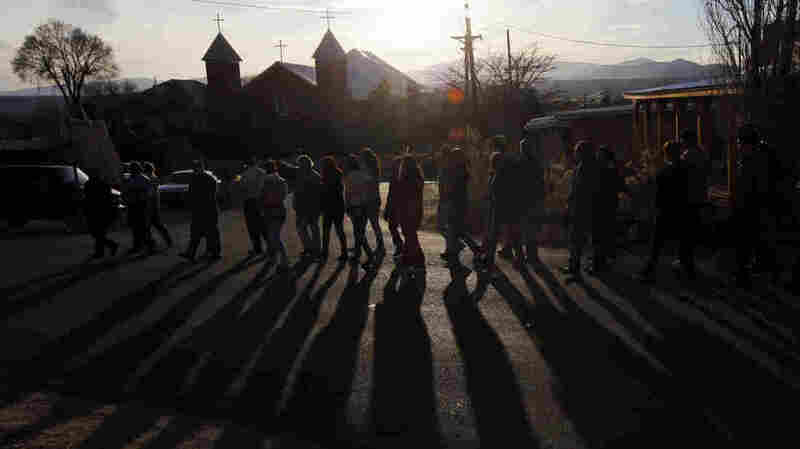 In northern New Mexico, among the Catholic brotherhoods known as the penitentes, Good Friday is the highest of holy days. The brothers sing ancient Spanish hymns about life, death and piety — hymns they've helped preserve. Tonight, the rough-hewn prayer houses called oratorios will open their doors and invite the public to sing the plaintive religious songs known as alabados. These hymns used to resonate inside parish churches scattered across the Spanish land grants of northern New Mexico and southern Colorado. Over time, the old songs fell out of fashion, and today it's the penitente lay brotherhoods that keep them alive. I visited an intimate prayer house on this night last year for the dramatic Good Friday service. Tucked in a grove of cedar and pinyon pine, this oratorio was built of stone and adobe in 1825. The altar is filled with statues of saints; on the walls are devotional paintings. Fourteen candles are extinguished one by one — for each Station of the Cross. People from nearby towns sit on benches along the sides. The brothers stand in the middle, chanting prayers. The religious fraternities have existed here in the foothills of the Rockies for centuries, ever since the Spanish arrived. The penitentes formed as a way to keep the faith alive because parish priests rarely made it to these secluded villages. When New Mexico became part of the United States in 1848, the Catholic Church began to "Americanize" and suppress these societies, with their Old World songs and their practice of self-flagellation. But they were eventually reintegrated into religious life. And today, the brotherhoods practice charity, march in processions for the healing of drug-addicted communities and pray for the dead. They typically sing alabados at wakes, called velorios, and during Holy Week services like this one. Alabado comes from the Spanish verb alabar — to praise. "We say alabado, but it's really a longer phrase — it is Alabado sea Dios o Alabado sea el Señor," says A. Gabriel Melendez, a professor of American studies at the University of New Mexico in Albuquerque and a penitente brother himself. "It would be translated 'Praised be the Lord, praised be God.' "
In the penitente prayer house I visited, in the tiny village of Los Ancones, about an hour and a half north of Santa Fe, the chapter novice master is Felipe Ortega. He has a gray ponytail, wears jeans and sandals. He's also a potter. In his studio in the town of La Madera, Ortega molds clay into coffee cups. "Good Friday for us is a big day," says Ortega. "The hymns, most of them are in minor chords, because of the lamentation or whatever you want to call it." Ortega has helped to preserve the alabados. As the chapter historian, he translated them from Spanish scrawled in notebooks into English. They were then published in the first standardized hymnal now used throughout the penitente world in the American West. "We try to stay faithful to the melody as it was handed on down to us. Why change something that is already beautiful?" Ortega says. "And these are to be sung not just simply by reading words. You have to feel them. You have to feel them in your soul." As the Tenebrae service nears midnight, all of the candles have been extinguished. In the darkness, the oratorio smells of wood smoke, and there's a feeling of suspense. Then, just after midnight, the brothers create — in sound — the moment when Jesus died, with a cacophony of yelling, noisemakers and drums. Despite the late hour when the alabados have lulled everyone into spiritual serenity, the cacophony startles the congregation. "When I sing an alabado it's a moment in which I am at the doorway, at the boundary line between the present and the eternal," Melendez says.